This book is about a dog named Chad and his person or owner named Mal. 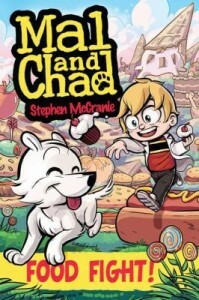 Chad has a nightmare because he is scared of dogs and his dream comes to life. They try to fight it.Also Megan and her friends have a club Mal wants to join in. They dont let him but Mal makes his own club. Later on Mal fights the monster so they let him join but he refuses. My favorite part of the book is whenever Mal fought off the monster and saved Megans friends moms life. If you like funny,animal, cute, And interesting comics, you’ll like this book. This book’s genre is fantasy. This book’s story line is action oriented, funny. This book left me feeling cheerful, curious, giggly, grateful, inspired, motivated. On a scale of 1-5, I give this book a 5! This review was written and submitted by 4th grader Xuan.